It’s no secret for any green thumbed readers that keeping your lawn green and healthy can be difficult at the best of times. However the UK has been baking under an unprecedented heat wave the past few weeks and the met office has confirmed that this heat could continue for another month! This recent warm weather has brought plenty of sun for the plants, but the high temperature & lack of rainfall has left many gardens and plants dry, discoloured and malnourished. So how do you manage to keep your lawn a healthy green during the uncomfortably hot weather? In this blog we will discuss some tips to help you keep your garden a lush green despite the elements. This one goes without saying, if we aren't getting rain for an extended period of time - you need to water the lawn yourself. The best time to water your lawn is in very early in the morning as the sun begins to rise. 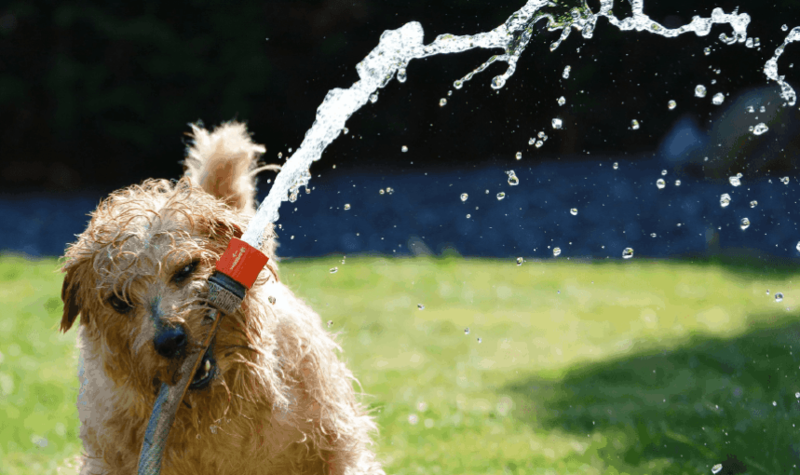 If you do not have a sprinkler system that you can set to a timer or are not an early riser, another great option is to water in early evening just as the sun is beginning to set. By giving the turf a good soak once during this time allows it to soak deeper into the soil and water left on top of the ground will avoid being evaporated by the sun. Top Tip: As well as plenty of water to keep the turf moist, feeding the lawn with will be a great way to help keep it nourished as well as aid recovery in scorched areas. During the hotter weather we recommend not mowing the lawn as often as you normally would. Just once a week is plenty, so when you do - adjust the mower blade a little higher than you would do normally. Top Tip: When you do mow the lawn during a heat wave, leave the grass clippings on the lawn, this will behave like mulch and help reduce water evaporating from the soil below. If you haven’t got around to weeding the garden, then now is the perfect time to do so. Weeds and moss on the grass will be competing for vital nutrients and water so removing this unnecessary competition during a heat wave is a great way to help the lawn when water is already scarce. When the warm weather finally subsides, this is an ideal time to carry out any repair work to any damaged areas and reduce the chances of damage if there is a drought next summer. If the recent heat wave has been tough on your garden and want to start fresh, be sure to check out our turf on our products page. Online Turf offers high quality turf at an unbeatable price as well as free and fast next day delivery nationwide. For more handy guides and tutorials, check out our knowledge base.